14oz chopped tomatoes undrained. This is a standard, canned size. Pre-heat your oven to 350. Get out your favorite one pot pot. Make sure it can go in the oven. Adjust your oven rack accordingly. (Use your mitts, cuz I had you turn the oven on. Sorry about that.) I have a Le Creuset pot that I think I can use for everything. I’m going to be buried in it. Add half the oil, heat on low and add the meat. Brown until all browny. Remove only the meat. Leave the juicy goodness. Drizzle remaining oil into pan. Think of your glowing skin, strong ligaments, and NOTHING ELSE. Add chopped onion and carrot. Continue to cook until they sparkle and shine and tell you its time to move on. Add the parsley and garlic and mushroom slices. When it sounds like applause, stir in nutmeg, bay leaf, and thyme. If you use fresh thyme, you may want to remove the leaves and toss the stems to avoid eating needles later. Totally up to you. Stir and cook for 3 minutes more. Add wine. *A note about the wine. At my cousin’s house, there is no oh, we’ll-just-save-this-for-when-we-make-stew wine. Its all OHMYGOD-we-have-to-drink-all-of-this-before-we-die wine. And let me tell you: good wine makes good food. Its not wasting wine to cook with it. Don’t be a baby. Once the wine starts to lose some of its purpley-ness, add the tomato. Let it return to a simmer, then put the beef back in. 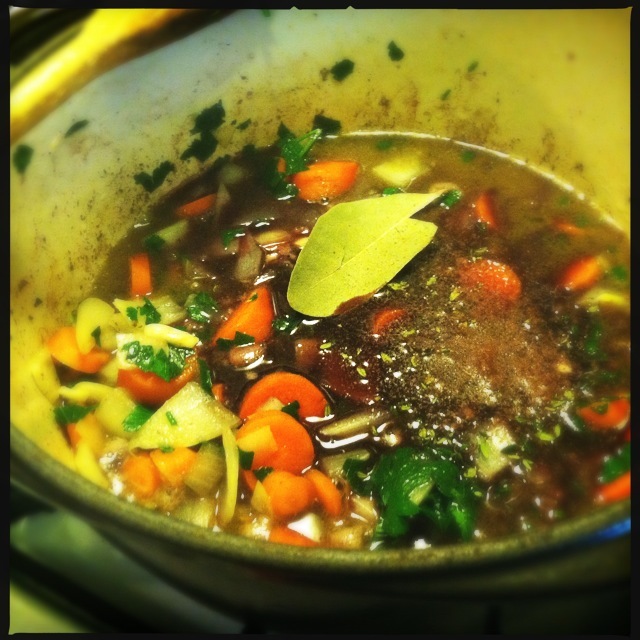 Add the stock, and olives. OK, so that’s everyone, right? At this point I add black pepper, but not salt. Then I stir and stir and re-think my decision to not add salt and add much less than I think it needs. I am intimidated by salting. As we all know, over-salting cannot be undone. (don’t start with the potato trick. It doesn’t work) So go light on it. There’s olives in there…and tomato…and stock…surely its plenty…ah, screw it – add more salt. Put it in the oven for 1.5 hours. Take this time to lovingly wash, rinse, dry, and evenly slice your beloved bell pepper. You have nothing better to do. Take our your stew. Holy crap, that looks good. Now add the sliced bell pepper and stir. Put the stew back in the oven and turn the oven off. You can set the table, make a salad, do shots…whatever. Leave it alone for 30 minutes. Now you’re done. This stew needs no rice, noodles, corn bread or whatever else you may be tempted to make since your oven is on and you feel the need to “round out” the meal. Have two bowls of stew if you’re still hungry. This stuff will treat you right. No belly-bloat. No regret burps. Enjoy…go ahead and finish that wine…and sleep the sleep of kings. Could you throw all this stuff in your crock pot and leave the house and come back to something fantastic? Probably. But please, for the love of all things good, brown the meat first. It’s just the decent thing to do. This entry was posted in meat, paleo. Bookmark the permalink.